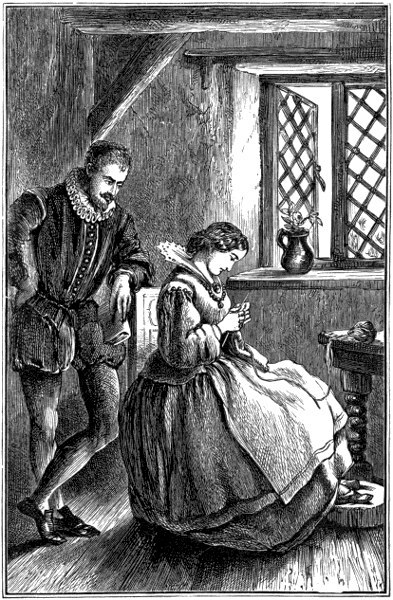 Highly detailed engraving illustrating a woman knitting while a man watches over her. This knitting image is interesting but the backstory is even moreso. What we see is a gentleman watching his fine lady as she toils away knitting some item. The man depicted in this picture is William Lee. He was a scholar of limited means and his wife would supplement their income with her knitting. Lee, wishing to gain more free time for his wife and gain more of her wifely attention, invented the stocking frame – a mechanical knitting machine. Sadly, Lee never truly benefited from his marvelous invention. This image was included in the interesting book about Triumphs of Invention and Discovery in Art and Science which was published by T. Nelson and Sons of London in 1871.